Vladimir Putin answered to questions from Russian newspaper "Russia Today" during his stay in Paris where he attended a ceremony marking the 100th anniversary of World War I.
Putin supports Macron's idea of forming an European Army. "Europe is a powerful economic entity and union, and it is very natural that member states want to be independent and sovereign in defense and security," Putin said. Vladimir Putin answered questions from Russian newspaper "Russia Today" during his stay in Paris where he attended a ceremony marking the 100th anniversary of World War I. 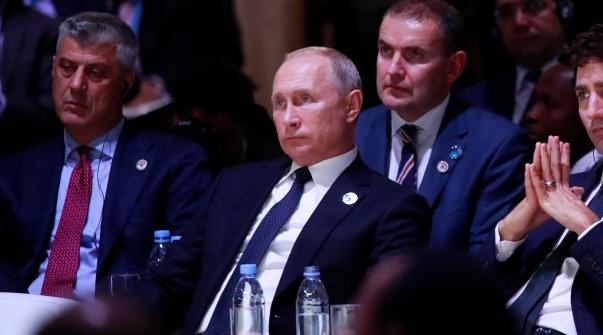 Asked about the statement by the President of France, Emmanuel Macron, some days ago about the idea of the European Army, Putin said: "Europe is a powerful economic entity and union. For this reason, it is very natural that member states want to be independent and sovereign in defense and security. I think this is a positive development in the multilateral world. " The Russian president said France played an important role in this context and added that the united European military could be an alternative to NATO.